Objectives To quantify the frequency and type of new safety information arising from studies performed under the auspices of the Pediatric Exclusivity Program, to describe the dissemination of these findings in the peer-reviewed literature and compare this with the US Food and Drug Administration (FDA) review, and to describe their effect on pediatric labeling. Design Cohort study of the 365 trials performed for 153 drugs. Setting The Pediatric Exclusivity incentive from December 1997 through September 2007. Participants Food and Drug Administration publicly available records and peer-reviewed literature retrievable by MEDLINE search. Main Exposures New safety findings obtained from the trials completed for exclusivity. Outcome Measures Concordance of the information highlighted in the peer-reviewed article abstracts with the information in the FDA labeling and drug reviews. Results There were 137 labeling changes; we evaluated 129 of these (the 8 selective serotonin reuptake inhibitors were excluded from review). Thirty-three products (26%) had pediatric safety information added to the labeling. Of these, 12 products had neuropsychiatric safety findings and 21 had other important safety findings. Only 16 of 33 of these trials (48%) were reported in the peer-reviewed literature; however, 7 of 16 focused on findings substantively different from those highlighted in the FDA reviews and labeling changes. Conclusions Medication adverse events in children often differ from those in adults, particularly those that are neuropsychiatric in nature. Labeling changes for pediatric use demonstrate that pediatric drug studies provide valuable and unique safety data that can guide the use of these drugs in children. Unfortunately, most of these articles are not published, and almost half of the published articles focus their attention away from the crucial safety data. Most prescription drugs on the market do not contain adequate information in their labeling regarding their pediatric use. 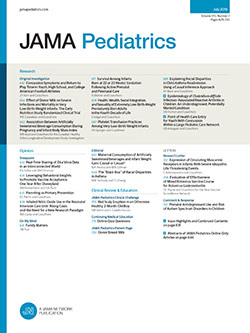 The long-standing and widespread nature of this problem was demonstrated by 2 surveys of drug monographs in the Physicians' Desk Reference, in which 78% of products in 1973 and 81% in 1999 lacked sufficient information or labeling regarding pediatric use.1,2 Without the provision of appropriate information concerning pediatric dosing safety or efficacy, physicians who treat children must decide between withholding treatment proven effective in older patients or participating in the practice of off-label use by prescribing to children products not studied for pediatrics. Off-label use, with dosages based on untested hypotheses, puts children at increased risk of adverse events in exchange for often unproven potential therapeutic benefit. The Pediatric Exclusivity Program was reauthorized as part of the Food and Drug Administration Amendments Act of 2007; however, several policy questions remain unanswered. This program is a substantial investment,9 children cannot give consent, and the trials are technically challenging; thus, how to best transform these data into public health policy beyond modification of the existent labeling is vital to public health. We address these questions by assessing the availability of safety information resulting from pediatric trials conducted in response to the legislative efforts. We examined the clinical trials analyzed in the FDA reviews and subsequent labeling changes that incorporated new pediatric safety information resulting from the exclusivity incentive between December 1997 and September 2007. We then compared the review conducted by the FDA with the data available in the corresponding peer-reviewed publications. In contrast to the medical reviewers at the FDA, journal editors, referees, and readers rarely have access to individual patient data obtained in the clinical trial. We sought not only to report the safety results derived from these studies (many of which are unpublished), but also to examine the nuances of what has been put forth in the peer-reviewed literature and to comment on the implications of these findings for current and future public policy. We identified all drugs that received pediatric labeling changes as a result of the Pediatric Exclusivity Program through September 2007 (Figure). Studies for exclusivity were solicited by the FDA in the form of written requests issued to pharmaceutical companies. The written requests specified required elements of the studies that were performed, including age ranges, sample sizes, study design, and trial end points. Companies were required to submit to the FDA all of the data from these trials. Products studied for pediatric exclusivity and subsequent disposition. FDA indicates Food and Drug Administration; SSRI , selective serotonin reuptake inhibitor. Of the products submitted for pediatric exclusivity (n = 153), new pediatric information was included in the labeling for 137 (89.5%; Figure). We excluded selective serotonin reuptake inhibitors (n = 8; Figure); these products had a black box warning added to their product labeling that detailed an increased risk of suicidality in children and adolescents. This warning was the result of trials conducted in children for exclusivity. Ultimately, additional antidepressant drug trials contributed to the final analysis, and these data have been previously analyzed and disseminated.10 We analyzed the FDA reviews and labeling of the drugs for which new pediatric safety data were elucidated (n = 33; Figure); these included those with neuropsychiatric findings (n = 12) that were unexpected or greater in frequency than anticipated from studies completed in adults, and products that had other safety findings (n = 21). We have previously described the fraction of studies published in the peer-reviewed literature across the Exclusivity Program.8 In the present study, we used similar search strategies to obtain publication status, including (1) searching MEDLINE with the product generic name, “all child (0-18 years),” “1998-2008,” and “English language”; (2) generic name, “1998-2008,” “English language,” and ages of trial participants; and (3) use of keywords from the study design provided by the written request and the generic name (allowing capture of manuscripts prior to 1998). We then compared the text of the FDA labeling and medical review with the abstract and text of the peer-reviewed article. When the FDA review and article abstract differed markedly, we copied the results of both the FDA report and the article for side-by-side comparison. We received a waiver of review from the Duke University Medical Center Institutional Review Board and a letter of exempt status from the FDA's Research Involving Human Subjects Committee because there were no associated patient identifiers in any of the patient-level data that we analyzed. In the first 10 years of the Pediatric Exclusivity Program, a pediatric exclusivity determination was made for 153 products. More than 95 000 children were in enrolled in 365 trials, from which there were 137 pediatric labeling changes. Of the 365 trials, 67 had 1 or more safety events as their primary end points, 197 were well-powered efficacy trials, and 109 focused on the pharmacokinetic end points. Twelve products with unexpected and important neuropsychiatric safety findings have been elucidated (Table 1). Food and Drug Administration medical reviewers found an increase in suicidal ideation compared with adults in a trial of ribavirin and interferon alpha. Agitation was observed in young children exposed to famotidine; this resolved on discontinuation of the product. Aggressive and hyperactive behavior was more frequently observed in children exposed to tolterodine compared with placebo, and postmarketing experience with sumatriptan demonstrated serious adverse events rarely described in adults, including stroke, vision loss, and death. In addition to the 12 products with notable neuropsychiatric adverse events, 21 had substantive safety concerns when tested in children. Use of several of these products (Table 2) resulted in adverse events related to growth including suppression of the hypothalamic-pituitary-adrenal axis (betamethasone, mometasone) and musculoskeletal events (ciprofloxacin and levofloxacin). Two anti-infectives (ertapenem and linezolid) failed to achieve reliable concentrations in the cerebrospinal fluid, and 2 products that were used for anesthesia (desflurane and propofol) were found to result in severe laryngeal spasm and increased mortality, respectively. Also noteworthy was the early discontinuation of a trial evaluating the use of irinotecan for the treatment of refractory tumors and untreated rhabdomyosarcoma due to progressive disease and early deaths. Information on only 16 of 33 products (48%; Figure) with neuropsychiatric and other safety concerns has been published in the peer-reviewed literature retrievable by MEDLINE search. Nine articles had abstracts and article text that accurately reflected the FDA clinical review and labeling change. Seven articles substantially differed in their presentation and interpretation of the data submitted to the FDA.11-17 In Table 3, the text from the labeling change (available at http://www.fda.gov/cder/pediatric/labelchange.htm) is shown alongside the abstract conclusions and relevant quotes from the article text. In 2007, Congress renewed the Pediatric Exclusivity Program for an additional 5 years. With this extension, there are 3 major mechanisms of pediatric drug development in the United States: the Pediatric Research Equity Act, the Best Pharmaceuticals for Children Act Pediatric Exclusivity incentive, and the off-patent process. The Best Pharmaceuticals for Children Act off-patent process, originally outlined in 2002, allows the National Institutes of Health to sponsor studies for pediatric labeling for products that no longer have marketing exclusivity protection. This mechanism has never been appropriately funded, and, though a number of studies are ongoing, as of the time of this report, no studies have been submitted that have resulted in pediatric labeling. Pediatric exclusivity has been extremely successful in ensuring the completion of many pediatric trials and subsequent labeling concerning pediatric use. The paucity of pediatric trials makes dissemination of the outcomes and data from all trials in this program important because of the frequent off-label use of these products. A detailed description and analysis of each trial including outcomes of the trials, case report forms, and tabulations, as well as any supplemental information, are compiled into a final study report that must be submitted to the FDA in a manner that is appropriate to support new pediatric labeling. The FDA then reviews all of the available data and negotiates any new labeling modifications with the company. Historically, the FDA did not put information about failed studies in labeling. As of 2007, the FDA requires information to be added to product labeling on studies done in response to either the Best Pharmaceuticals for Children or Pediatric Research Equity Acts, including information concerning negative studies. Pediatric drug trials are often conducted after a product has been developed for adults, and information developed from previous adult trials is often used to design pediatric trials. In addition, because of the small number of pediatric patients with a given disease and the ethical mandate that children should not be exposed to additional risks without potential benefit, pediatric studies tend to be smaller in size. However, well-powered safety and efficacy trials for therapeutics are a critical component of pediatric health. We have highlighted 12 products with neuropsychiatric safety findings and 21 other products with crucial safety concerns such as laryngospasm, increased rate of progression of cancer, and increased risk of death. From these studies, it is noted that adverse events and serious adverse events in the Pediatric Exclusivity Program were commonly localized to the central nervous system. This finding is of special public health concern, given the gravity of findings (eg, suicidality, death) and the potential effect of these products on the developing brains of children. The high frequency of neuropsychiatric adverse event findings in these trials demonstrates the public health need for continued conducting of well-powered safety trials in children. These findings are especially remarkable given the relative size of the trials. If the expected serious adverse events rate in the placebo group is 10%, to detect an absolute increase of 10% in incidence of serious adverse events (20% incidence in the product group and thus a number needed to harm of 10), then a trial of 400 children provides 80% power. To detect an absolute increase of 5% in the incidence of serious adverse events, a trial of 1370 children provides 80% power, ie, a sample size that is larger than all but 2 of the trials conducted for exclusivity. To detect an increase of 2%, a trial of 7682 children provides 80% power. Of the studies completed for exclusivity, 25% enrolled 30 children or fewer (mostly pharmacokinetic studies); the median sample size was 103, 25% of trials enrolled 214 or more children; and 2 studies enrolled more than 1000 children. The Pediatric Exclusivity Program has greater transparency of data than that available for adult patient populations. This increase in transparency mandates the public dissemination of the results of clinical and pharmacologic trials submitted to the FDA in response to a written request; the FDA Amendments Act of 2007 requires that written requests, as well as medical reviews, clinical pharmacology reviews, and statistical reviews, be made available on the FDA Web site for applications in response to the Best Pharmaceuticals for Children and Pediatric Research Equity Acts. Transparency in the Exclusivity Program can be further improved by increasing the fraction of studies published in the peer-reviewed literature and providing greater access to study data. These data advance previous findings by showing that the few studies that are published often emphasize results that are discordant from the findings viewed as important to public health by the FDA reviewer. The FDA reviewers, as part of their employment, are vetted and cleared of conflicts of interest. The decision to grant exclusivity is a team effort in which multiple staff members of the agency participate. These members have expertise in clinical pediatric medicine, ethics, epidemiology, clinical trials, pharmacology, toxicology, and statistics. Some discordant results are among the most notable findings of the program. Differences between peer-reviewed published articles and FDA reviews may reflect incomplete access to data by journal editors and referees. Other reasons include the lack of consistent numeric or clinical threshold or criteria for inclusion of adverse events in drug labeling. This can lead to different interpretations of the same set of data by FDA reviewers and other researchers. The Pediatric Exclusivity Program grants marketing protection, which, in turn, leads to higher prices for drugs that are bought (at least for elderly persons) by Medicare dollars. We and others have shown a low incidence of publication, and we have previously provided evidence that if data are not published within 3 years of being submitted to the FDA, they are unlikely to ever be published.8,19-21 It might be proposed that all data collected during these trials and submitted to the FDA also be submitted in a public manner similar to the approach provided for the off-patent studies that are conducted under the second mechanism discussed above. More importantly, greater access to data will result in greater dissemination of findings, and thus improve children's health. Correspondence: Daniel K. Benjamin Jr, MD, PhD, MPH, PO Box 17969, Duke Clinical Research Institute, Durham, NC 27705 (danny.benjamin@duke.edu). Accepted for Publication: May 28, 2009. Author Contributions:Study concept and design: Benjamin, Murphy, Califf, and Li. Acquisition of data: Smith, Sun, Murphy, Avant, Mathis, and Li. Analysis and interpretation of data: Benjamin, Sun, Avant, Mathis, Rodriguez, and Califf. Drafting of the manuscript: Benjamin, Sun, Avant, Mathis, and Li. Critical revision of the manuscript for important intellectual content: Benjamin, Smith, Murphy, Avant, Mathis, Rodriguez, and Califf. Statistical analysis: Benjamin. Obtained funding: Califf. Administrative, technical, and material support: Sun, Murphy, Avant, Mathis, Califf, and Li. Study supervision: Murphy. Financial Disclosure: Dr Benjamin reports receiving research support from Pfizer, Astellas, and Biosynexus; Dr Li reports receiving research support from Sanofi-Aventis, Bristol-Myers-Squibb, Genzyme, PTC Biotherapeutics, and Pfizer. Dr Smith reports receiving research support from Astellas Pharma, US, Cadence Pharmaceuticals, Inc, Cubist Pharmaceuticals, and Pfizer. Dr Califf reports receiving research support and/or consulting honoraria from Annenberg, Ortho McNeil, Bayer, http://Heart.org, J&J, Kowa Research Institute, Lilly, McKinsey & Co, Medtronic, Merck, NITROX LLC (in which he also has equity), Novartis Pharmaceutical, Schering Plough, and Scios. Drs Murphy, Mathis, Rodriguez, and Sun, and Ms Avant report no financial disclosures. Funding/Support: This study was supported by grants 1U10-HD45962-04 and 1UL 1RR024128-02 (Drs Benjamin, Smith, and Li), and 1UL 1RR024128-02 (Dr Califf) from the National Institute of Child Health and Human Development. Dr Benjamin has received support from the US Government for his work in pediatric and neonatal clinical pharmacology (1R01HD057956-02, 1R01FD003519-01, 1U10-HD45962-06, 1K24HD058735-01, and Government Contract HHSN267200700051C), the nonprofit organization Thrasher Research Foundation for his work in neonatal candidiasis (http://www.thrasherresearch.org), and from industry for neonatal and pediatric drug development (http://www.dcri.duke.edu/research/coi.jsp). Disclaimer: The views expressed in this article are those of the authors. No official endorsement by the US Food and Drug Administration is provided or should be inferred.